Thomas A. Dorsey. Thomas Dorsey is often called the father of Gospel Music. His father was a minister; his mother a piano teacher. He played blues piano until personal tragedy led Dorsey to leave secular music behind and begin writing and recording what he called gospel music -- Christian praise combined with the rhythms of jazz and blues. After his first wife and son died in childbirth he wrote his most famous song, "Precious Lord Take My Hand." 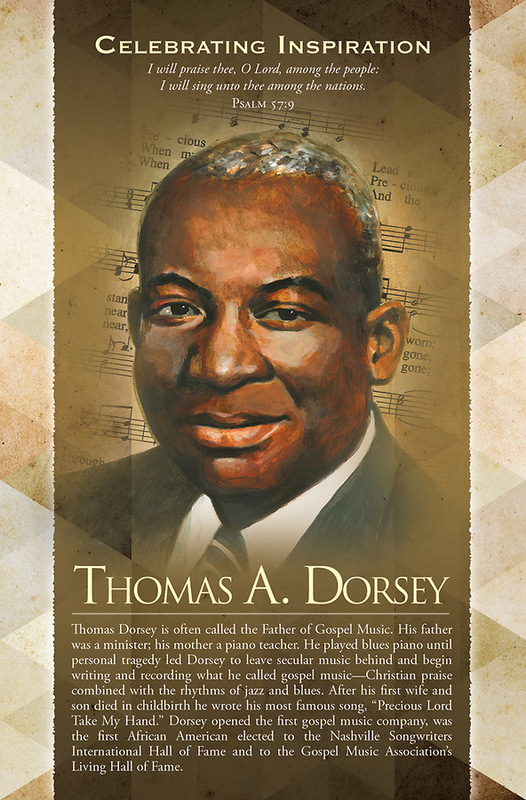 Dorsey opened the first gospel music company, was the first African American elected in the Nashville Songwriters International Hall of Fame and to the Gospel Music Association's Living Hall of Fame. The bulletin is shown folded (8.5" x 5.5"), exactly as church members and visitors will receive it. The back side is blank to include the information you choose. Worship bulletins arrive packaged flat 8.5" x 11" to fit into your printer or copier; shrink wrapped in packages of 100.